With the two Koreas seeking to establish an inter-Korean liaison office at the Kaesong industrial park in North Korea, the construction project appears to demonstrate underlying differences between Seoul and Washington over their dealings with North Korea. South Korea has said that the construction project does not clash with a series of sanctions imposed on North Korea. The Moon Jae-in administration asserted that the measure could foster cross-border exchanges and build mutual trust for the denuclearization process. The US, meanwhile, has been cautious about dramatically improving relations with North Korea without significant denuclearization measures. The concern has been fueled over the possibility the sanctions regime may be broken by providing fuel and equipment for the construction project. Seoul’s foreign and unification ministers Tuesday downplayed the concern over the allies’ potential discord regarding the liaison office. They suggested the opening of the exchange venue could be granted an exemption from US and other sanctions imposed on Korea. “We are exchanging views with the US that setting up a liaison office does not clash with the sanctions,” said Foreign Minister Kang Kyung-wha during a meeting with lawmakers at the Foreign Affair and Unification Committee. 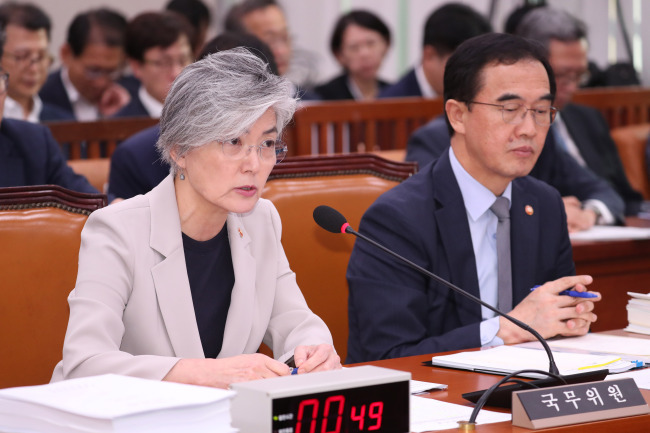 Unification Minister Cho Myung-kyun, who attended the same meeting with Kang, noted that the sanction exemption could be justified, as the North Korean government is not the main recipient of banned materials supplied to the liaison office. Under the current UN sanctions, the transfer of any money and shipments of equipment to North Korea are prohibited. But the restrictions can be exempted “on a case-by-case basis” by the UN Security Council’s sanctions committee. The Foreign Ministry said it could ensure transparency of operations of the liaison office at the Kaesong industrial park, such as power supplies to the cross-border facilities using oil and other petroleum products. According to Foreign Minister Kang, South Korea and the US “share the same understanding” that establishing the inter-Korean liaison office is key to implementing the Panmunjom declaration adopted after the inter-Korean summit on April 27. Moon and North Korean leader Kim Jong-un agreed then that the two Koreas would establish the joint liaison office in Kaesong. The measure, the agreement said, would enhance government talks and civil exchanges. During his speech on Liberation Day on Aug 15, Moon pinned high hopes on the liaison office. The office would open up “in a few days,” and then, the two Koreas can communicate with each other “24 hours and 365 days,” he said. “We need more close consultation with North Korea for denuclearization, but the current exchanges of messages through Panmunjom are very limited,” Unification Minister Cho told the lawmakers Tuesday. While the US has yet to publicly oppose the establishment of the liaison office, concerns are mounting over the risk of undermining economic sanctions aimed at limiting oil supply to the reclusive regime. Citing an unidentified senior US official, the Chosun Ilbo reported Monday that the Moon administration’s decision to supply the banned materials to North Korea might clash with UN and US sanctions. According to Yonhap News Agency, the US State Department acknowledged that setting up the liaison office is part of the pledge between the two Koreas, but declined to comment on whether the project would clash with sanctions. “We reaffirmed the Panmunjom Declaration during the Singapore Summit and we did so because progress on inter-Korean relations must happen in lockstep with progress on denuclearization,” an unnamed State Department official was quoted as saying by Yonhap.